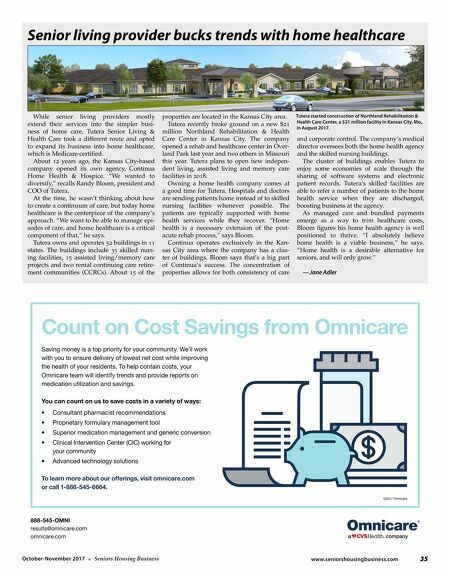 www.seniorshousingbusiness.com 35 October-November 2017 n Seniors Housing Business Count on Cost Savings from Omnicare Saving money is a top priority for your community. We'll work with you to ensure delivery of lowest net cost while improving the health of your residents. To help contain costs, your Omnicare team will identify trends and provide reports on medication utilization and savings. You can count on us to save costs in a variety of ways: • Consultant pharmacist recommendations • Proprietary formulary management tool • Superior medication management and generic conversion • Clinical Intervention Center (CIC) working for your community • Advanced technology solutions To learn more about our offerings, visit omnicare.com or call 1-888-545-6664. ©2017 Omnicare 888-545-OMNI results@omnicare.com omnicare.com Senior living provider bucks trends with home healthcare While senior living providers mostly extend their services into the simpler busi- ness of home care, Tutera Senior Living & Health Care took a different route and opted to expand its business into home healthcare, which is Medicare-certified. About 12 years ago, the Kansas City-based company opened its own agency, Continua Home Health & Hospice. "We wanted to diversify," recalls Randy Bloom, president and COO of Tutera. At the time, he wasn't thinking about how to create a continuum of care, but today home healthcare is the centerpiece of the company's approach. "We want to be able to manage epi- sodes of care, and home healthcare is a critical component of that," he says. Tutera owns and operates 52 buildings in 11 states. The buildings include 35 skilled nurs- ing facilities, 15 assisted living/memory care projects and two rental continuing care retire- ment communities (CCRCs). About 15 of the properties are located in the Kansas City area. Tutera recently broke ground on a new $21 million Northland Rehabilitation & Health Care Center in Kansas City. The company opened a rehab and healthcare center in Over- land Park last year and two others in Missouri this year. 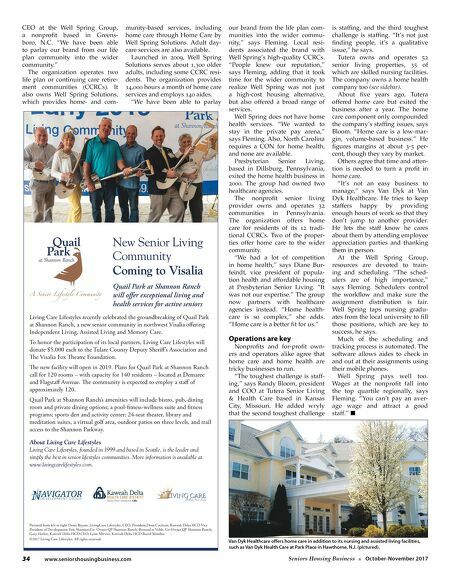 Tutera plans to open new indepen- dent living, assisted living and memory care facilities in 2018. Owning a home health company comes at a good time for Tutera. Hospitals and doctors are sending patients home instead of to skilled nursing facilities whenever possible. The patients are typically supported with home health services while they recover. "Home health is a necessary extension of the post- acute rehab process," says Bloom. Continua operates exclusively in the Kan- sas City area where the company has a clus- ter of buildings. Bloom says that's a big part of Continua's success. The concentration of properties allows for both consistency of care and corporate control. The company's medical director oversees both the home health agency and the skilled nursing buildings. The cluster of buildings enables Tutera to enjoy some economies of scale through the sharing of software systems and electronic patient records. Tutera's skilled facilities are able to refer a number of patients to the home health service when they are discharged, boosting business at the agency. As managed care and bundled payments emerge as a way to trim healthcare costs, Bloom figures his home health agency is well positioned to thrive. "I absolutely believe home health is a viable business," he says. "Home health is a desirable alternative for seniors, and will only grow." — Jane Adler Tutera started construction of Northland Rehabilitation & Health Care Center, a $21 million facility in Kansas City, Mo., in August 2017.